This flag is a reconstruction of the flag believed to have been displayed during the first attempt to have California secede from Mexico. It was not uncommon for the Mexican tri-color without the eagle and serpent to have some other device or words substituted. This was a “Californio” attempt. 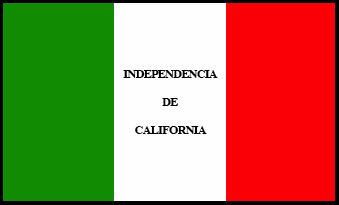 The text on the flag reads INDEPENDENCIA DE CALIFORNIA or “California Independence.” The story behind this flag is that Mexican officers sympathetic with the notion of independence for California took this defaced Mexican Civil flag to the Padre at the Mission Santa Barbara. The good father refused it, being against overthrowing the established order, but it was later carried south and flown over the Mission San Buenaventura. There is no surviving original of this flag. The flag is described in a manuscript held at the Bancroft Library in Berkeley California. California “Lone Star” Republic Flag 1836. Alvarado’s “Lone Star” California Flag 1836. Oldest Remaining Flag in California (Original – Autry National Center). 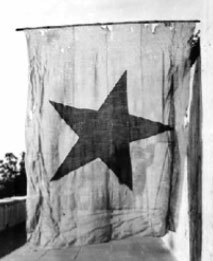 In 1836, Juan Alvarado vowed to gain increased autonomy for California from Mexican rule with either “bullets or words.” He hoisted this white flag with a single, centered, red five-pointed star at Monterey. In 1834, Alvarado had been elected to the Alta California Legislature as a delegate and appointed customs inspector in Monterey. The Mexican government had then appointed Lieutenant Colonel Nicolas Guterrez as Governor against the wishes of the legislature. In November of 1836, Alvarado and Jose Castro (with Vallejo’s political support) surrounded the presidio at Monterey and forced Guterrez to surrender power to them. At the time of Alvarado’s revolt, he still favored remaining a part of Mexico, and working with the Mexican government. With Vallejo’s political support, he went on to become a two-time Governor of Alta California from 1836–1837, and later between 1842–1845. This flag survives and is preserved in the Autry National Center in Pasadena, California. It may be the oldest surviving flag in the State of California.